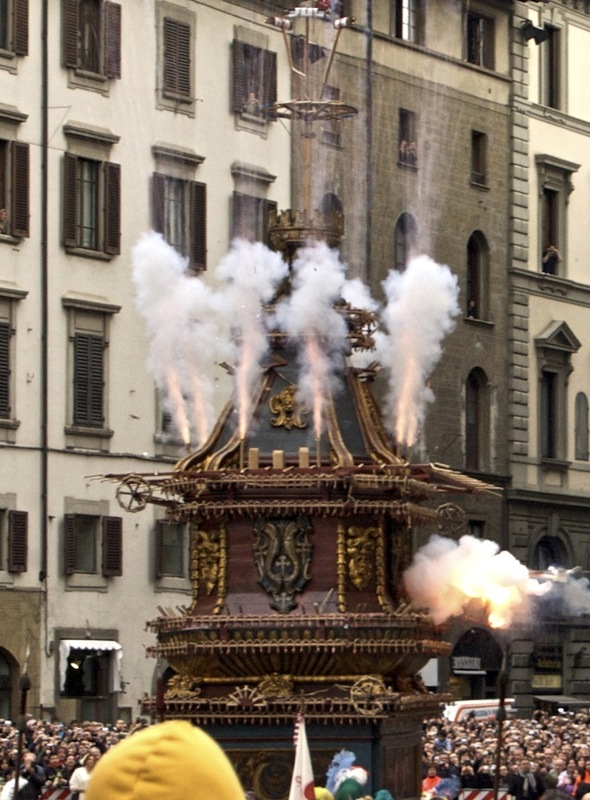 If you want to witness one of the more strange, interesting and exciting rituals of Easter than the "Explosion of The Cart" or "Scoppio del Carro" (also known as "il Brindellone" or the "Cart of St. John") is a must see event on Easter Sunday in Piazza Duomo. It is an ancient tradition that dates all the way back to the crusades, and an elaborate event that has to be seen in person to be fully appreciated. A large, towering wooden "cart" is pulled into the square between the Duomo and the Baptistry by huge white oxen and accompanied by much fanfare, flag throwing and bell ringing. Inside the church, a fake dove is ignited in the middle of mass and sent on a wire into the cart that is loaded with various fireworks and explosives (and I mean loud explosions that go one for several minutes - and lots of smoke). The quality of the fireworks predicts the fate of Florence for the year - while in the middle ages it was more closely linked to the quality of that year's harvest. If you are in Florence for Easter don't miss this extraordinary event. The event starts around 10 a.m, with the The "Explosion of The Cart" happening around 11 - make sure you get there early for a good viewing spot! You can also enter the church for the mass, or follow the cart's procession before or after the ceremony.